Soft dorm seating is in short supply in college. Your college will provide you with your dorm bed and desk dorm chair to sit on, but other than that you're stuck with the cold, hard dorm floor. You're going to want other soft dorm seating options for when you have friends over and when you just want to relax and study somewhere comfortable. 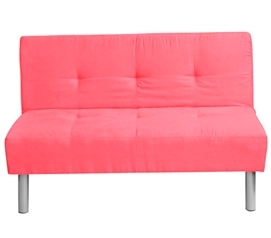 DormCo offers a variety of colors for our dorm mini-futon. Whether you want to match colors with the rest of your dorm room decor or you want to add a pop of color, you're sure to find a color you love in a cozy dorm seating option! Dorm room seating is always sparse. When friends come to hangout or come over for movie night, where are they going to sit? Add a futon for college to your college supplies so that friends will have soft dorm seating and you'll have a place to nap. A cheap futon also makes a great dorm seat for lounging or doing homework. Mini-futons for college are also ideally sized to fit in small dorms. Dorm furniture, after all, can't be too bulky since you'll have plenty of other dorm stuff and college supplies that you'll need to fit. Futons for dorms are also perfectly reusable college products! Use them every year in college for a little extra comfort in your dorm room!